The conference is officially over and the breaking news is that I have managed to succeed where the lot in the picture right next to this miserably failed. 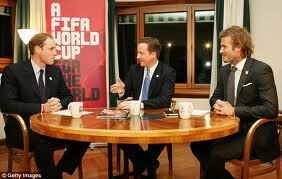 Somehow they lost the bid to bring the world cup to London (beaten by Qatar!). Hahaha :) Congratulations are in order ! I was actually not "in" on the ambush: it looks like the stellar reputation of UCL is the only cause :-) That'll be brilliant ! I even thought of the perfect social event already!